The College Decision Navigator is designed to help families navigate the academic and admissions side of college to get the student accepted to the college of his or her dreams. This jammed packed ebook comes complete with calendars, checklists, and step-by-step guidelines on how to figure out what the student wants from college, narrow down the list of schools, and increase your odds of getting in. DOWNLOAD COLLEGE DECISION NAVIGATORSend me this free guide. A year by year list of tasks that every high school student should be doing. Discover potential career opportunities long before selecting a college. Analyze 20 major factors to determine the ideal six to eight colleges to apply to. Know what to ask and look for when touring schools. Increase your odds of acceptance with step-by-step processes for essays and applications. Acquaints the student with the college standardized tests and provides tips on improving scores. SEND ME THIS FREE GUIDEI would like a free copy of the College Decision Navigator. "This really gets into the decision making process. It has some great tips on the questions to ask during a college visitation, and how to conduct myself during a college interview, which I will probably use for job interviews when I graduate." "The best part of this guide are the calendars of to-dos. It covers every step my daughter needed to take from freshman to senior in high school. I looked all over the Internet, but this guide laid it all out for us by month, which made the whole process lots easier. Thanks!" Will this booklet guide me through the entire college process? 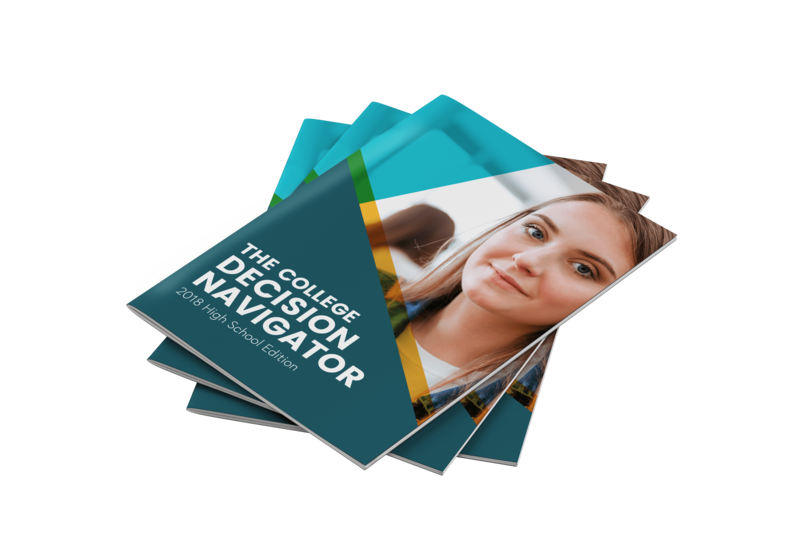 The College Decision Navigator workbook is designed to help parents and their college-bound students achieve the highest level of understanding of the complicated college process. It will guide you through proper college selection and visitation and steer the student through a basic search to help prevent the 5- to a 6-year college degree and college major switches, all of which can help you reduce costs. Is this really free-of-charge? Once I give my personal information, are you going to charge me some way, or hound me to buy something? You will not be hounded by anyone. If we contact you, it would start by email. Some families are very busy and request our personalized guidance, and others merely download the booklet and try to do everything themselves. Either way, we want to help our community and get introduced to college-bound families that could use our help. Does the College Decision Navigator help me decide which colleges to apply to? Because choosing the right school is such a personal decision, the College Decision Navigator takes you through 25 strategic steps in the college selection process. It covers campus culture, diversity, distance from home, student body size, majors offered, and which of these things mean most to you. It walks you through the college selection process step by step to help you find the best colleges that match your interests and talents. Does the College Decision Navigator only cover the college selection process? No. The College Decision Navigator workbook will also show you how to achieve the highest ACT/ SAT scores and how to move through the college admissions process efficiently. This guide, if followed correctly, will provide both student and parents with the information they need to get the maximum value for their college dollar. My first choice college I applied to wants to interview me. I’m very nervous about being interviewed. Does the College Decision Navigator provide the interview preparation I need? Our experts that put the College Decision Navigator together know first-hand how to prepare for a college interview. The College Decision Navigator will guide you through the interview process and help you put your best foot forward when it counts. I would like a free copy of the College Decision Navigator.